More then 60 years ago one of the most anticipated social events of the fall semester was the opening of a room in the south wing on the third floor of Main Building. Sophomores sang and performed for their sister class, the seniors, while enjoying what might be their only opportunity to see one of the most richly decorated rooms on campus. The seniors were just as excited, each waiting to see how their contributions had helped in the composition of the room specifically for their class. An annual event occurring at end of October or the beginning of November, the Senior Parlor was a 70-year tradition at Vassar, from its first opening in 1872 until its closing in 1943. Originally occupying a room on the second floor of the north wing of Main Building, the parlor was established to provide Vassar seniors with their own space to entertain guests and spend their free time in privacy. Underclassmen were permitted into the room by invitation only. When the parlor first opened the room was simple enough, as Cornelia Knowles Fitch, Class of 1873, wrote many years after leaving Vassar: "How well I remember the joy it was when this room was opened. The only two items of interest in the room, and which filled our hearts with such delight, was a piano and Nottingham lace curtains at the window." The simplicity of the original parlor did not last as the tradition grew older and the room provided was larger. After two years in the north wing of Main, the parlor moved to a room in the south wing on the third floor of the building. The decoration of the parlor became an involved effort. Each year a committee decorated the Senior Parlor with funds raised from the students. 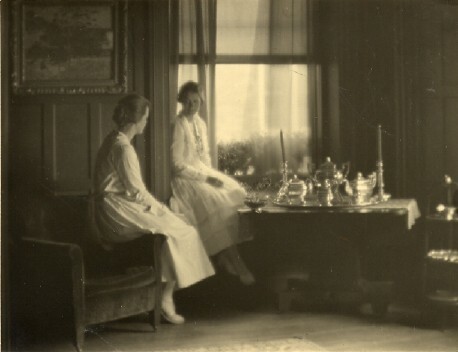 In addition each member of the graduating class donated an item, whether it was a book, a tea set, or a painting, that would be included in the parlor. At the end of the school year all the members of the Senior Parlor committee were listed in the Vassarion along with a photograph of the room from that year. Many of the items in the parlor were donated by students' families specifically for their use in that year. Ranging from expensive furniture, oil paintings in gilt frames to homemade watercolors, and favorite books, a wide variety of contents graced the parlor. Regardless of where things came from, the constant concern was to create a place that would reflect that year's graduating class. An inventory of the Senior Parlor of 1882 notes that Prof. Maria Mitchell approved of the decoration, considering it "simple." To which, it says, the senior Mary R. Sanford expressed the hope that, "Professor Mitchell would never learn the cost of the simplicity." "It [the Senior parlor] entails annually a serious economic waste… and secondly it brings on certain girls in each class a severe tax, the heaviest tax falling unfortunately on those girls who derive the least benefit." The writer went on to describe the parlor's frivolity: "A pretty parlor, nothing more. Not a room beautiful in the best sense of the word. Not a room of college character and atmosphere. Not a room rich in memory and association. No one can deny that the Senior Parlor is pretty, but is prettiness the only, or even the chief characteristic to be desired?" However, as Vassar entered the 20th century, enthusiasm for the Senior Parlor was as strong as ever. In 1898 the parlor had been moved to another room on the third floor corridor, and it remained in that room for the rest of its existence. 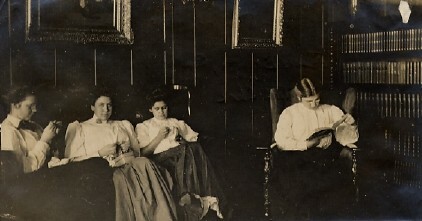 Lea D. Taylor, Class of 1904, described the parlor in a letter to her family in the fall of 1901. A sophomore that year, she had just participated in the room's opening, and she wrote admiringly of the hangings, walls, and the furniture that were all "soft shades of brown" and the "beautiful" oil paintings on the walls. "Oh we made that [Senior Parlor] perfectly beautiful. We got pretty dresses for it, we each gave something for it, and we took what we gave when we went, to remember it by." 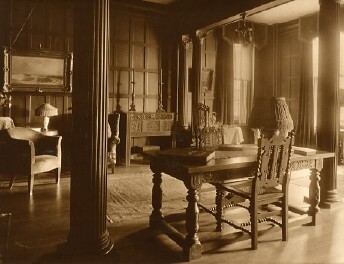 During the summer of 1907 the parlor was wainscoted from floor to ceiling in oak. While this meant the walls could no longer be repainted by each succeeding class, all the furnishings and wall hangings remained interchangeable. 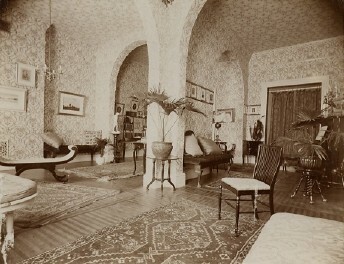 In a letter to her mother in the fall of 1913, Muriel Tilden, Class of 1914, mentioned some of the valuable furnishings in the Senior Parlor, these included a rug that had been given by the Shah of Persia to a missionary, and a linen chest that was a replica of a 1677 piece of furniture. By the late 1920s the expense and attention taken to composing the parlor had diminished. It was no longer a requirement to redecorate the parlor every year, and while the Senior Parlor remained a valued privilege for seniors, the room began to look much the same year after year. In 1934 the Senior Parlor made its last appearance in The Vassarion, and by 1937 the planning committee wasn't mentioned at all. With the graduation of the Class of 1943 the parlor was officially closed, and the books remaining in the room were moved to the Raymond Reading Room directly across the hall. While the Senior Parlor gave way to other class traditions its legacy in Vassar history persists. In 1990 the Vassar College Special Collections presented "Come Into Our Parlor" an exhibit highlighting the history of the Senior Parlor and it's place in the lives of students over 70 years. Although the private parlor became less practical and less desirable as class size grew and social freedom's increased, in the end, it is a space that can be warmly remembered. It was a place important to Vassar's continuing growth and change, as, at the turn of the century, it offered a semblance of responsibility to graduating students as they carefully prepared a room to reflect themselves and their class before entering into adulthood. Vassar College Senior Parlor Subject File. Vassar College Archives. The Vassarion 1887-1937. Vassar College Special Collections.